Thinning Strong vines: Natural thinning only, 2 ppm GA3 @ 6-8 mm size, no Ethephon for colouring. Weaker vines: 2 pmm GA3 @ 110% flower for thinning, no spraying for size needed. Promote natural thinning by inducing growth vigour. Additional GA3 for thinning may delay colouring and cause loose berries. Sizing 1 x 2 ppm GA3 (no sizing sprays necessary if spraying for thinning). Too much GA3 affects colour. Girdling Sizing sprays can be replaced by girdling. Ethephon No Ethephon required in Hex River. 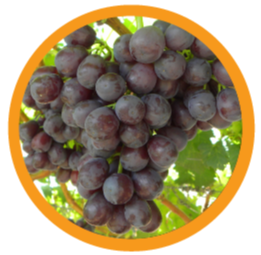 Picking Harvest at minimum 21 ˚Brix due to high acidity level to ensure optimum eating quality. Loose berries Sizing applications of 5 ppm GA3 and higher can increase the occurrence of loose berries.